There are so many ways we wind up feeling like an impostor! For years I didn't quite believe that I had written a 'real' book, in spite of its physical presence on my shelf. When it went out of print, I struggled again with the fact that I had actually written a book. There were no more copies to be had, so was it really real? Eventually, with the help of some friends, it got turned into a PDF and I sold copies that way. But is a digital version really 'real'? Now I am working on a second title. I still can't quite wrap my head around the fact that I am once again attempting to put technique into words. 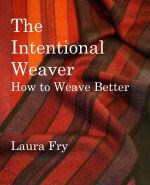 The Intentional Weaver is much bigger in scope than Magic. And much, much more difficult. Meeting with a professional editor suddenly made this whole endeavour real in a way that it had not been previously. A 'real' editor! Somehow it made me feel as though I really was a 'real' author! Because I had an editor!!! Since I cannot afford to print any kind of copies, then warehouse them, the decision was made to use an on-line host. We found one based in Canada that offered both digital and print-on-demand options. Since people had been saying over and over again that they wanted a 'real' book, not a digital version, this hosting site seems to fulfill everything that will be required. The offering for Magic, already in PDF format, went live on Wednesday. Since then there have been sales to customers in the US, Canada and Great Britain. I was amazed anyone was still interested in getting a copy. On the other hand, there have been new weavers come along since the original Magic became out of print in it's original format. Being able to test the site to see how easy/difficult it was, then have real, actual, customers purchase, well, it was eye opening. And I think I am a little more comfortable calling myself an author. The really valuable thing about the trip to California and spending four days going through the manuscript is that I now feel that I have good bones to build on. There is much more to do before it will be ready for publication. But it feels right now. And I feel a whole lot more confident that this (oh, my!) 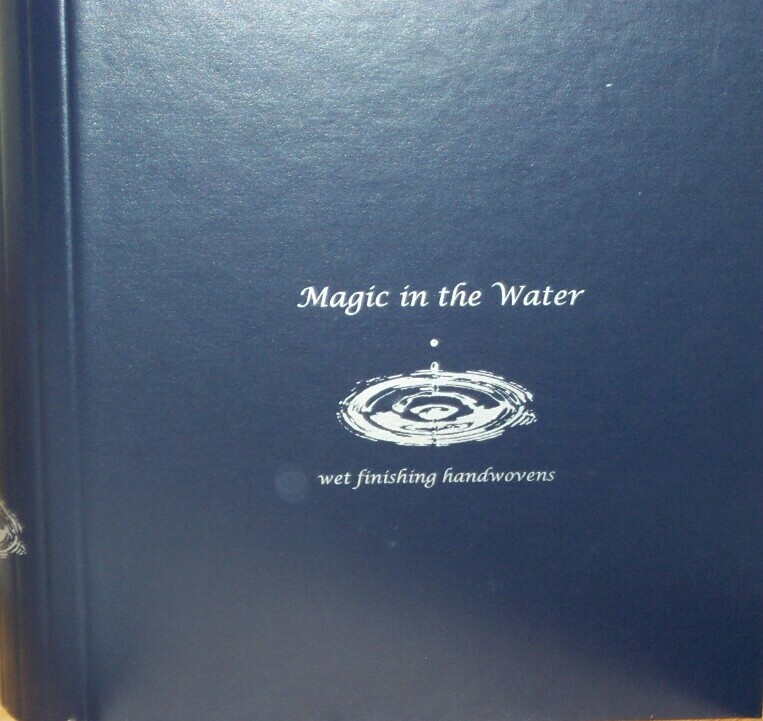 second book has something of value in it. No event comes into being without a lot of effort before it sees light of day. Venues have to be found, dates secured, budgets formulated, equipment found. For the past couple of months there have been arrangements being made for upcoming Master Weaving classes, both at Olds and in satellite locations. These events have now gone 'live' at this link. Scroll down the page for upcoming scheduled classes. (edited to add, put Master Weaving into the search bar. The link gets you all of the college offerings, not just the master weaving classes.) If anyone is interested in taking a class, they will have to create an account (if they haven't already done so) in order to register. For the class in Cape Breton, the college is taking class registration. Students will have to go to the Gaelic College site to register for room/food. There are other things still in the planning stages and until they are sorted out I don't feel I can talk about them in case things fall through. But changes are in the wind. Technology has made it more and more possible for distance learning, for those who are interested in that due to life commitments. Perhaps distance is an issue and workshops not easily accessible in real life. We live in interesting times. Stay tuned! It has been a productive stay and things have progressed fairly quickly. Faster than I had hoped, even. There has also been time to visit with friends, make new acquaintances, visit some museums. Developments are underway for the rest of the year and hopefully projects will come to a successful conclusion. Some I can talk about, some need to mature a while. Olds College Master Weaver program continues to grow. Opportunities to take level one at satellite locations will be announced soon, plus level two will happen in Cape Breton the first week of June. They are also looking at offering level one the last week of May. I’ve been asked to teach level one again at the college in June. The paperwork arrived this week and their website should be updated shortly with this year’s course offerings. With the technology now available to have on line classes, there are more and more opportunities for these to happen, too. In addition to Janet Dawson’s Craftsy classes, Jane Stafford’s on line guild, Margaret Coe’s and Tien Chiu’s, there are more people entering the world of on line teaching and learning. Stay tuned for more. Tomorrow is my last day here before I head home on Friday. 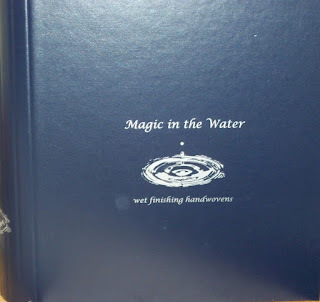 I hope to have an announcement in the next few days about Magic in the Water. Is what I should be doing, but I can’t get to sleep. At least it isn’t a six am flight, so there’s that. This is one of the pieces of art in the Vancouver airport, where I hope I will be in 12 or so hours. So far the weather is looking good here, but I’m not sure if it will be good in Vancouver. So many things to think about, even for a short trip. We take air travel so much for granted now. It’s hard to believe but the very first time I flew on a plane was to return home from Sweden in 1969. You see, I’d taken a berth as a passenger on a freighter, out of Montreal to Oslo, then a train to Sweden. And then I had to get home. So I flew from Stockholm’s Arlanda airport to Vancouver. Air travel has changed a lot since those days. But then, so many things have changed. Even hand weaving, although I hadn’t begun to weave in 1969. That was to come later, in 1975. 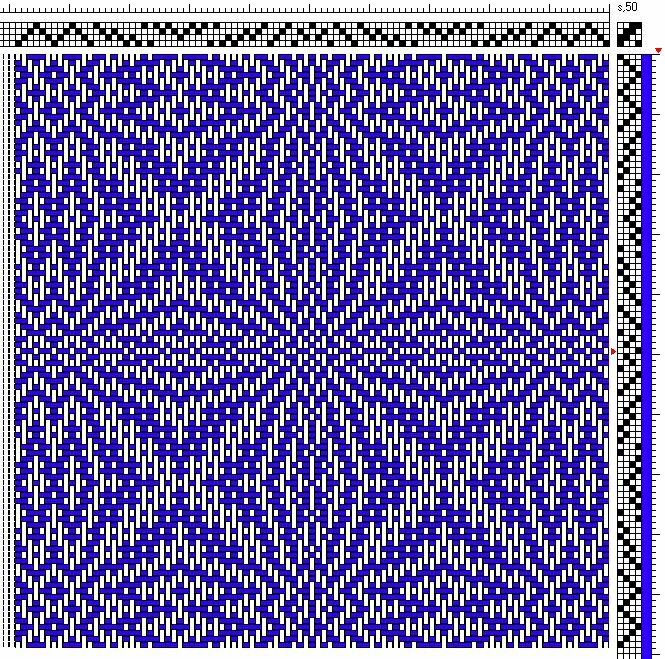 And now, in 2018, I am about to go meet Tien Chiu’s loom, a Jacquard, with a computer interface. Such a loom for hand weaving had not been thought of, I don’t think, in 1969. After all, home computers had not really been thought of, either. And now, we email across the world, post digital photos and videos to the internet and communicate in ways that only science fiction writers seemed to think of. Cell phones. Fitness trackers with Bluetooth connections to iPads. And more. A fairly stressful 2017 rolled into an equally stressful new year. Not that all stress is bad, just that there has been too much of it of late. So on Sunday I leave for a wee respite. I will have time to visit with friends, talk a lot about textiles in general and weaving in particular. Plans continue for the conference here next year, plus other irons are in the fire. I am just suspicious enough that I don’t want to talk about them too much just in case they come to naught. 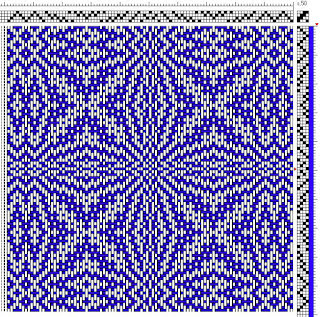 But I’m not leaving until Sunday, so I’m beaming another place mat warp. Because it already is beginning to look like this year is going to evaporate very quickly and I have a slew of things I really want to get done. In a fit of mid-winter blues I started referring to deadlines as dreadlines. Feeling overwhelmed with life, continuing dental woes, lack of energy, looming deadlines were viewed with a certain level of dread and stomach clenching anxiety. In the past few weeks I have managed to make sufficient progress that I realized calling them dreadlines was a level of negativity I did not want to subscribe to, gave my head a shake and applied shoulder to the wheel with a renewed sense of purpose. It would help if I weren’t so prone to taking on such large, sweeping, projects. Projects that didn’t take such an enormous amount of time and energy. Like co-chairing a reasonably large conference. Like trying to write a book. Like dressing the loom with 40 yards of warp. Etc. But if I didn’t, well, I wouldn’t be me. A friend tries very hard to be a helpful, positive energy in the world. We joke that she tries to save the world. I have given up that sweeping and daunting a task, but no doubt I will continue to try to accomplish large, sweeping projects. But I swear, this conference and this book? Once they are done? No more. On social media feeds I have been seeing people with their spring seed catalogues and packets, making plans for the future. A sense of optimism prevails and we make our plans, plant our seeds. And this is how I feel about teaching. Planting seeds. I tend to spread my little nuggets of information as broadly as possible - here, Facebook, Twitter, Instagram - because I never know where one of those seeds will take root. Sometimes people will contact me and let me know that they have taken root with them. And I deeply appreciate their taking the time to let me know. As I spread my thoughts, my knowledge, my opinions with wild abandon I sometimes look upon myself with a certain amount of chagrin at how bold, how brazen I can sometimes be. But then I see the spark of understanding light up someone's eyes and the cockles of my heart warm. A new year brings new dates. Nothing is set in stone yet. Many details still need to be hammered out. But I can say that - should there be sufficient registration - I have accepted the level one class at Olds Fibre Week for this year. There are also plans forming for Cape Breton, a possibility of level one and two. And another seed is seeing if it will take root, but plans are too nebulous to talk about yet. With a craft as densely layered as weaving, there are many stages along the way to 'finish'. In order to keep myself motivated on the long journey from fluff to fabric, I count 'finishing' stages as a way to measure progress. Today was a catch up kind of day. Since lunch I've cleared some clutter off the floor because I have a floor cleaning elf coming. She needs to be able to see it before she can clean it! A niece was asking for donations and since I have a bunch of hand spun, hand knitted shawls on hand, it was obviously time to wet finish and block them. So five of those got dealt with and are now on the floor (on plastic) drying. The five skeins of yarn that had been plyed were also wet finished. I worked on the article for Handwoven. I've still got almost 3 yards of warp left. Am I done? Or do I weave off the rest? Hmm. Just finished rough sleying a mat warp and needed to change out of my heavy shirt into a t-shirt or I was going to start feeling awfully warm. The way I beam I can work up a sweat, even in the winter, even wearing a t-shirt. Details. Lots and lots of details. I have been working on the conference. A conference is like a workshop, only on steroids. Because instead of just one person leading one event, a conference has many instructors and an order of magnitude greater of participants. So I begin, now, 18 months or so prior to the event proper, trying to nail down as many of those details as I possibly can. My binder. Yes, I have a binder full of people. The binder is chock full of what I hope are intriguing topics. Most of those topics require equipment and supplies, some of which need to be provided by the facilities we are renting, some by the conference host, some by the instructor, and some, of course, by the participants. To make these workshops/seminars run smoothly, everyone has to know who is supplying what, and when. So I am making lists, checking them twice (thrice, more) and one of the other committee members is making spread sheets for us to work from to keep track of it all. We are matching instructors to room availability and will likely need to rent things like projectors. The facility will need to re-arrange rooms to accommodate the various topics. Organizing a conference isn't much different than designing a textiles. There are lots of things to take into consideration. A certain flexibility is required in order to make sure everything runs smoothly. 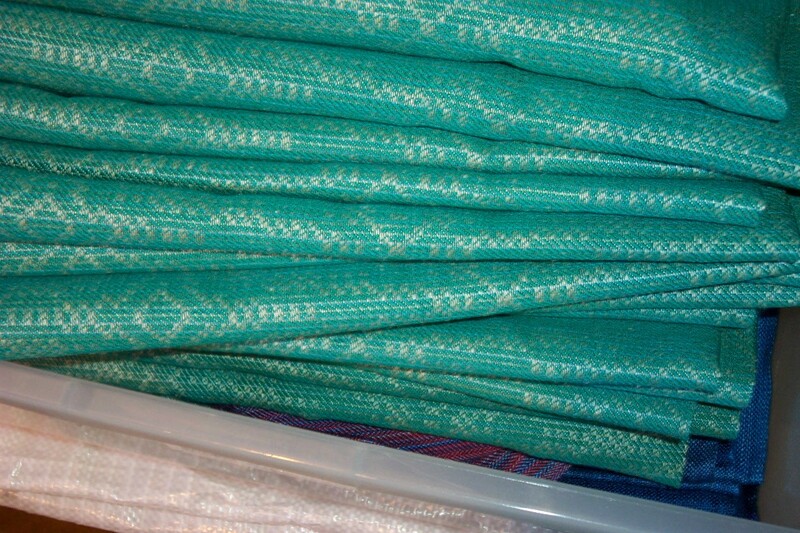 There is a ton of stuff that needs to be done before the event, the textile, ever comes to fruition. My job is to oversee the gathering of the details and make sure they all fit into a hopefully seamless whole. Details. It's all in the details. Making textiles. Many ways to do that. So long as you are getting the results you want, you're doing it 'right'. I've banged on and on about beaming under tension. Some people agree, some don't. The above is a photo of a warp being beamed in a mill in England. This beam is an interim step to get the yarn from the cone into a format where it can then be transferred to the actual loom beam. My thought is that this very large beam helps even out any little discrepancies that may happen in the actual winding process. The warp is wound under high tension here, and then again onto the proper beam. No, this is not a spool but a full sized beam for a full sized loom. It can hold many hundreds, maybe thousands (depending on thread thickness) of warp. The end flanges are probably close to a yard/meter, possibly more. It's been a while since I've seen one in real life. In order to open a shed in a loom, the warp pretty much has to be under some tension or else the threads will cling to their neighbours and not open cleanly. How much tension? Depends. Industrial looms weave under much high speeds than a hand weaver - one reason why I maintain that hand weaving, by its very nature, is automatically 'slow cloth', regardless of the equipment one uses. There are many many videos now on You Tube, all showing tiny little differences - sometimes a great deal of difference - from each other. As long as the weaver is getting the results they desire, they are not wrong. Industrial looms have no warp packing, BUT! the warps are wound under high tension. There is no slack anywhere in that warp for the threads below to shift or move to allow upper layers to cut down into lower ones. So, some people advise to use warp packing. I use it on my smaller looms, but not on the AVL where I generally beam sectionally - or if I wind the warp chain onto the sectional beam directly, the sectional dividers act like little flanges to keep the threads from moving. Plus, the tension. Again fairly high, depending on the length. But I have seen looms with no warp packing. Again, beamed under high tension and sometimes with the width adjusted so that the selvedge ends gradually move closer to the centre so that the warp package on the beam is sloped from the outer edge inwards /_____\ (with the horizontal line the surface of the beam). I have seen looms with no beam at all. 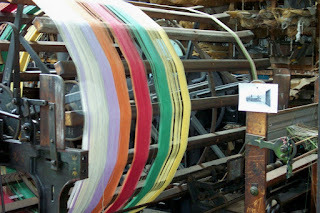 The warp was simply wrapped around a heavy weight like a big rock and suspended from a hook or rod in the ceiling or over the top of the back of the loom. The suspended rock held the tension on the warp so the shed would/could open. The new year has officially begun and it is time to gear up and start getting ready for the upcoming crop of deadlines/events! This round robin workshop (weavers will move from loom to loom to try the different threadings/warps) will take a close look at the weave structure we call 'twill'. Participants will dress their loom (or get assistance to get it dressed) prior to the workshop. Laura will accept 'new' weavers if they have at least taken Janet Dawson's on-line Craftsy class to familiarize themselves with some of the language of weaving. Local 'new' weavers should attend several drop ins prior to the workshop to get hints and tips and try their hand at the demo loom(s) in the guild room. This is not a 'beginning' to weave class but will be geared towards helping those who know at least a little bit about weaving to move on to the next steps. Time: 9:00 am - 4:00 pm - bring a lunch, beverages supplied. To register or for more information please contact Birthe at 250-964-6454 or birthe_miller@telus.net. Deposit of $50 by the February 20th, balance at the workshop. Billeting may be available for out of town students. The above draft is a reduced version of the 8 shaft Swedish Snowflake. But not everyone has 8 shafts, and after taking a close look at the threading I realized that it could be reduced to four. Obviously it is not as large a design, but on the other hand, the treadling is also much easier than trying to treadle a very long and fairly complex sequence. Twills are quite fascinating. The more shafts, the more complex the design can be. But a great deal can be done on four shafts, as well. The twill workshop in April will look at primarily four shaft drafts, but the guild also has a couple of 8 shaft looms - plus participants may have 8 shaft portable looms, too. But if you want to kick off your new year, you might find this workshop interesting. 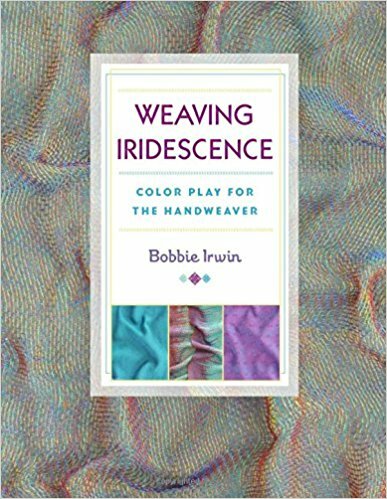 As I contemplate and work towards publishing a book I am reminded of two books for weavers that came out in 2017. Bobbie worked for a number of years to get her book published and it became available last summer. Tom Beaudet's book is a culmination of a lifetime of working with textiles, both as a textile engineer and a hand weaver and also became available from him/his company last summer. Bobbie's book can be purchased from her, directly or from Amazon. 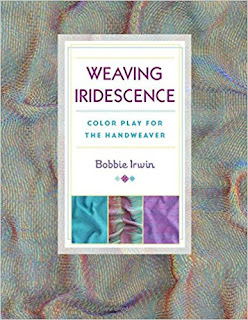 Bobbie has worked for many years with colour interactions and figuring out how to produce iridescence. If this topic is of interest, then you need this book. Tom and his grand daughter have put together his notes from many years of learning the art of textiles. They are an historical record of the process he went through to learn about weaving and the construction of textiles. I put this publication on my shelves along with other technical manuals such as Watson's and Goerner's books. These books are not for the beginner as such, but for people interested in the subtleties and nuances of how textiles go together. Or want a glimpse into the history of textiles and how people learned in terms of industry. Gathering technical information and putting it into a format for others to learn from is not an easy task. (Ask me how I know!!!!) 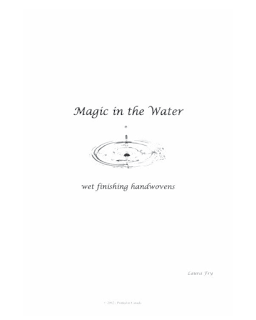 When I was floundering with Magic in the Water, Tom was very supportive and encouraging of my getting on with it, for which I will always be grateful. The weaving community is, by and large, very helpful and supportive of each other. Weavers have become my 'best' friends, whether I have actually met them in real life, or just been able to communicate with them, first by mail, now via the internet. I am proud of the members of this community, who come together to share their textiles, their information, their experiences. I am proud to call myself a weaver. Day one of a new calendar year. The cycle repeats. I am already well into production for the new year. As soon as I got home from Vancouver I started winding warps for place mats. And weaving them. And winding more. These are currently in the queue for weaving, while some have already been wet finished and hemmed, more are ready for the water. In between a couple of special commissions took some time. And of course, the holiday season, although with just the two of us, we never do very much. Just another potential work day. The other thing I have been dealing with is crushing fatigue due to a return of the lymphoma. After talking to the oncologist and weighing options I will try one of the new targeted drugs. Knowing someone who is already taking it has given me hope that this blip in my health will be a minor inconvenience, not a major upheaval. I have a few deadlines in January, a trip to meet with a book editor and then in February I will focus on my health again, with lab work, consultations, and hopefully approval to start the new drug. We live in amazing times with new cancer treatments coming along to help people live their lives. To make (some) cancer a blip. Thank you to the researchers, doctors and drug companies working on this puzzling, challenging disease.